Jaken accompanies Nephra and Zephra to the family forest to practice their sparing and fighting for the day. Zephra is becoming more skilled due to her intense practice while Nephra is learning only what she needs to but is also showing that she has a natural ability for fighting techniques as her mother and father do. After hours of sparing, Jaken tells the girls that they have had enough practice for one day and advises that they rest a while. While relaxing on the grass and enjoying the cool breeze, Nephra runs over to a tree that her mother used to measure their height from the very first time they ever went to the family forest. She tells Zephra to come over and see her height as well. They notice that from the last time they measured their height they have grown a whole inch more and that was only 3 weeks ago. Nephra goes to Jaken and asks him why do they seem to be growing at such a fast rate. Jaken explains to Nephra and Zephra, "That is what's so wonderful about being a demon, your childhood growth is fast however when you reach your prime age your features alter at a very slow rate. Although you continue to age your physical appearance will remain youthful forever." Zephra asks, "What is the life span of a healthy demon?" Jaken tells her, "Well, we full demons...we can live for hundreds of years..why your grandfather for example, The Great Dog General, he lived to be over 900 years old. You girls being half demons will more than likely live to be about 500 years, maybe a little longer." Zephra asks, "and during the 500 years, we will still look youthful?" Jaken replies, "Absolutely...you will slowly look older but no one will be able to tell your age for sure unless you tell them." Nephra asks Jaken, "But what about mother, she is not a demon...not even half demon, how long will she remain youthful?" Jaken replies, "Oh honestly, these poor pathetic humans don't have a chance. They are lucky if they survive to see the age of 90. A Human's appearance and body will fail them with each year pass 50 and more as they age, they'll start to look old and become sickly until they just pass away. It's absolutely pitiful." Nephra and Zephra look at each other both having the same worry for their mother, they now realize that their mother will die long before they will. As they head home the thought of their mother dying hits Nephra the hardest though Zephra is distraught by this bit of information as well. 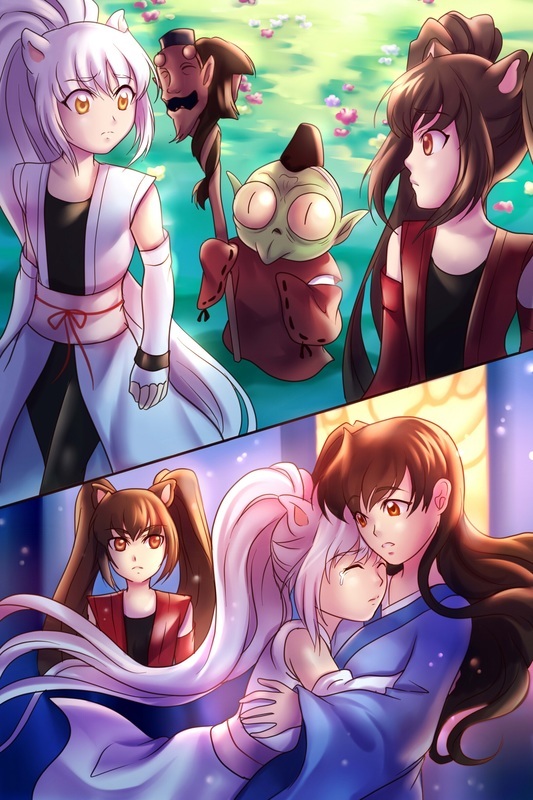 When Nephra, Zephra and Jaken reach the castle they see that Rin is speaking with Sesshomaru who is sitting at his throne. Nephra runs up and embraces her mother tightly causing Rin to look down at her with confusion. Sesshomaru makes no facial expression but is also curious of Nephra's extreme display of affection. Sesshomaru looks over at Zephra who is watching and he asks her, "What is troubling Nephra?" Zephra not wanting to show her true feelings calmly replies , "She just found out that mother is not long for this world." as she walks away. Rin hearing what Zephra said looks down at Nephra and assures her, "I won't be dying anytime soon." Nephra informs Rin, " But you will die long before we all do, I don't want you to go away and die." Rin hugs Nephra and takes her to have a cup of tea hoping it will help her feel better. Sesshomaru looks over at Jaken and asks him, "I suppose you provided them with this information?" Jaken bows to Sesshomaru and rambles on nervously, "Oh please forgive me Lord Sesshomaru, I didn't see any harm in telling them the difference between humans and demons, I had no idea they would get so upset Milord...I assure you that I...." Sesshomaru interrupts Jaken, "Silence Jaken...I am not angry. The truth is, I have pondered on this very issue for some time now. I will not let our daughters see their mother grow old and sickly, I will not let her die." Jaken asks, "What will you do master?" Sesshomaru stands up and continues speaking on the issue, "I will go alone to speak with my mother regarding this, she will likely have a solution to this problem. " Jaken responds, "Yes, as you will Milord." 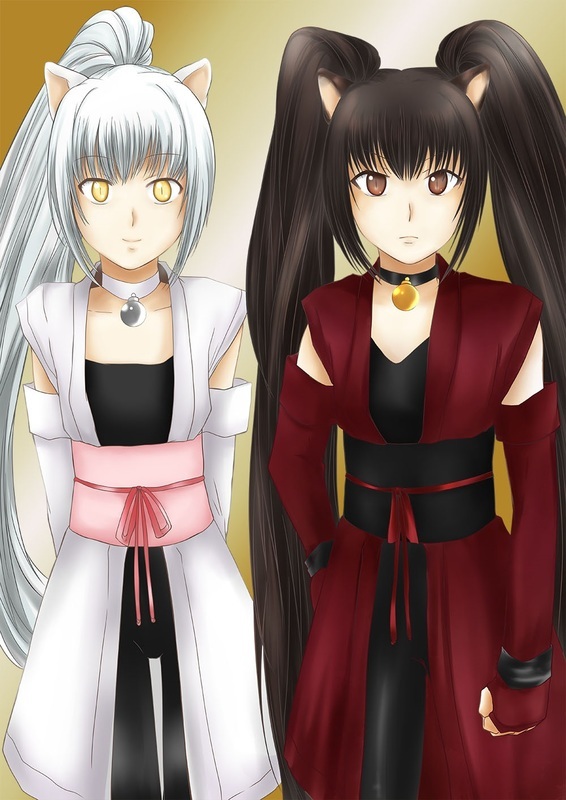 Rin and Nephra have a long talk over a cup of tea about humans growing old and dying, Rin attempts to make Nephra understand that when she dies she will go to an even better world in which all loved ones will be together again but this still does not comfort Nephra. Nephra sits outside behind the castle looking out at the pretty blue lake as the sun slowly begins to set. Heroshya arrives at the castle to join his father for the next day they would be traveling to retrieve the 3 swords of Lord Sesshomaru's Fangs. He walks up the corridor to the throne where his father would normally sit but is greeted by Jaken, "Heroshya, your father has gone to see the queen mother regarding an important issue, He will meet up with you soon...he requests that you remain at the castle tonight and be ready to retrieve the swords at dawn tomorrow morning." Heroshya abides his father's orders and decides to settle in at the castle for the first time since Lord Sesshomaru had his empire built. Heroshya steps outside behind the castle for a bit of air and stands there several minutes before he even notices Nephra is down below near the water looking out. Heroshya can tell that she seems to be sad or troubled by something but tries to ignore her presence and begins to walk back into the castle, He walks about half way when he has the uncontrollable urge to walk back out to her. He can not help wondering what could possibly cause a happy, fun loving girl like Nephra to sit around sulking like she is. He walks back out, stands behind Nephra and asks, "Ok Nephra...what are you upset about?" Nephra does not turn to him as she responds, "I don't want to talk about it, I just want to forget. When I think about it, it just makes me want to cry." Heroshya is even more curious now and asks in a concerned voice, "Did someone hurt you Nephra?, If so...you must tell me!" Nephra turns to Heroshya and replies, "No, nothing like that." Heroshya's concern finally puts a smile on her face as she asks him, "Heroshya, You seemed worried about me just then." Heroshya scoffs at her and says, "I don't care, It's just that father told me to look out for you pups because you can't handle yourselves yet, That's all!" Nephra indulges his pretense of not caring and says, "Oh, I see." she turns looking back at the lake. Heroshya continues, "Well, I guess you don't have to tell me what's upsetting you if you don't want to but it's getting dark out here... it's time you come inside." Nephra responds, "I just need to sit here a little while longer, then I'll be okay. Would you stay here with me, Heroshya?" Heroshya says, "hmmm, I guess you shouldn't be out here alone at night so I'll stay with you." Heroshya sits down next to Nephra and attempts to cheer her up by telling her, "I'm staying here at the castle tonight, I'll tell you another bed time story when your ready to go to sleep." Nephra looks up at him with big scared eyes remembering the last bedtime story he told her. Heroshya can't help but chuckle, "ha, don't worry...It will be a nice story." The two continue to talk and sit a bit longer outside at the lake as the moon and stars glisten off the water. 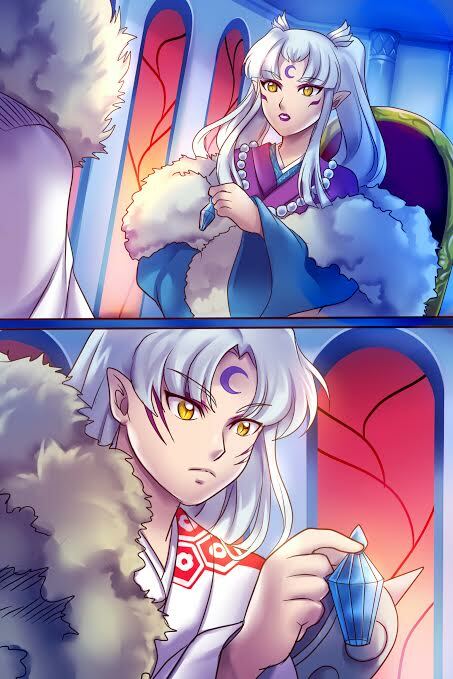 Meanwhile Sesshomaru is visiting with his mother, she is sitting in her normal spot on her throne as a demon servant brings her a special drink for demons, She asks her son, "Sesshomaru I am most happy to see you, though I see my granddaughters did not accompany you this time, why not? It has been many weeks since I have seen them last." Sesshomaru explains, "I come alone this time mother, I seek your advice about an issue that is upsetting my family and I as well." Sesshomaru explains to his mother that he is seeking a way to preserve Rin's life and that he as well as the children fear her death which will come much sooner than theirs. Sesshomaru's mother sighs, "If only you had married that lovely demon girl that bore your first child instead of that weak mortal girl, you would not be burdened with such issues." Sesshomaru responds in an irritated voice, "Mother!!" His mother continues, "However, I suppose if it wasn't for her....I wouldn't have my two beautiful grand daughters. Though she is human, she is after all my daughter inlaw so I will tell you what I know. Son, listen closely... there is a demon by the name of Shehomachi whom lives under ground in the southern region of a desert known as the Vale of Shi. His blood is most potent and if ingested by a human, not only can it sustain the human's life for many years past it's normal span but it also slows the appearance of aging by extreme measures and has a strong immunity to common human illness. Sesshomaru, be sure you understand that not many humans nor demons approach Shehomachi because his blood will be difficult to obtain." Sesshomaru thinks: Underground? how will I locate him inside the earth opposed to on it? Sesshomaru's mother calls to one of her servants and orders him to bring her the vile, once she receives the vile she gives it to Sesshomaru and tells him, "Fill this vile with Shehomachi's blood, it is the perfect amount to sustain her life, any more than this will be fatal for her." Sesshomaru examines the small bottle as his mother wishes him good luck on his journey. It is night fall however, Sesshomaru decides not to go back to the castle but instead continues on to the Vale of Shi to find the demon Shehomachi. It takes Sesshomaru all night to reach the Vale of Shi. The sun comes up and Sesshomaru stands on the desert ground trying to figure out how he will find Shehomachi's hidden lair and begins walking while waiting on an idea or thought to come to him. After a few hours of walking, He notices that during one of his steps his foot feels stuck in the ground, He stands still a moment and looks down at his feet and notices that his left foot is slowly sinking as he thinks: This appears to be ...quick sand. Sesshomaru is not worried about sinking, he simply morphs himself out of the quick sand and stands near it watching the sand slowly sink into the ground where he was standing, as he is seeing the sand sink he thinks again: I wonder if this could assist me into getting underground. Sesshomaru uses his demonic energy to burst the sand from the quick sand trap, the sand bursting from the hole creates a huge wind and looks like a tornado of sand and dirt flying out from underneath. When it seems there is no more sand within the sand trap, Sesshomaru can see that there is a huge crevasse that falls so deep that he can see no bottom to it, only darkness. Sesshomaru thinks: This must be it. He decides to leap into the dark sand trap crevasse to see where it will lead him to. Sesshomaru falls for quite a while before reaching the bottom, he can see light as he gets closer to the bottom and once he feels the ground at his feet again, he looks around and he finds himself in a huge round room that have many golden pillars against each wall around the room, atop of each pillar is a fire pot that helps to light the area from the darkness of being inside the earth. It is quiet for a moment but suddenly there are shrieks coming from a scorpion demon. It stands on eight legs and has two huge arms with snapping claws attached. The scorpion's teeth are sharp and strong and many of these types of demons begin to appear. They jump at Sesshomaru one by one as he kicks or strikes his claws at them. Numerous amounts of scorpion demons continue to attack as they snap at him and shot venom from their tails, causing Sesshomaru to unsheath his Buksaiga. He swings it one time and kills dozens of them but they continue to come. Sesshomaru wonders of their origin, while killing them with his sword he looks around to see where they are coming from and he eventually sees that they are emerging from a long crack in the wall. To help elimate as many as possible, Sesshomaru lifts his sword and points it in the direction of the cracked wall as he shouts, "BUKSAIGA !!!" and allows the demonic power of his sword to bolt into the crack. The crack in the wall lights up and there are loud sounds of death shrieks coming from inside. The remaining scorpions are killed and no more of them are being created. Sesshomaru stands once again in the middle of the now calm and quiet room as he thinks: I smell a strong scent of a demon near by. Sesshomaru then yells out, "SHEHOMACHI!!" As soon as his name is called a sudden shaking and loudess of an earthquake errupts, Sesshomaru is not startled at all as he waits for Shehomachi to emerge. The crack in the wall of the big round room begins to open even wider and gets bigger as Shehomachi begins walking through it. Shehomachi is a huge demon, in height and in build, He has a green complexion, muscular build and his voice is deep and consumes the entire room as he asks, "Who has entered my den?" Sesshomaru responds, "Shehomachi, I have come here to your lair to retrieve something of yours, give it to me and your life will be spared." Shehomachi : You have found and entered my haven as well as defeated my scorpions with in mere seconds of encountering them. This tells me you are extremely powerful for no one has ever found this place let alone dare to enter it. There is only one possible reason for your presence here, you wish to sustain the life of a loved one. Shehomachi: (after catching the vile in his hand) You do realize that my blood is only useful to humans? A demon such as yourself should have no need for my blood. Sesshomaru: I have all the necessary information that I need. Stop stalling Shehomachi and give me what I have come for. Shehomachi: I have no desire to fight you, I will gladly give you the life preserving blood from my body that you will need if you will go on a mission for me first .... I will give you your loved one's life, in return for my loved one's life. Only then will I grant your request. Sesshomaru: Ha, and what is to stop me from simply cutting you down right now and taking all the blood I need. Shehomachi: Trust me when I say, If you kill me...you will lose your only chance of keeping your loved one alive. My blood will only have the powerful ability of life longevity when I transfer my own demonic energy throughout it, otherwise it will be useless blood that will be ineffective to you or the human you are trying to cure. Sesshomaru: What is this mission? Shehomachi: Not far from here is a huge, black castle in the Southern woods, with in that castle...the one I love has been encased in a crystal bar as a punishment from her husband who found out about our affair. Many years ago, when she was first imprisoned...I killed her cruel husband but I was unable to reach the crystal that she is trapped in because it is being guarded to this day by two demons that are undefeatable. No one has been able to kill these two demon brothers for centuries, It seems they can not be hurt...they can not be killed and although my lover's husband is dead the two demon brothers continue to guard the crystal as their master ordered them to do. Sesshomaru: Nothing can kill them you say? That's ridiculous, all creatures have a weakness. Shehomachi: You are a powerful demon, retrieve that crystal and return it here to me. At that time I will transfer the demonic energy through the blood flowing in my veins which will save the life of your human. Shehomachi: I have one last piece of information that may be helpful to you, a clue that may hold the secret of bringing the demons down. Sesshomaru stops walking and turns his head slightly, listening for the additional information. Shehomachi continues: look to something that remains by their side always, it unites with them in their walk, unites with them in their talk, It participates with them in every battle. I have not been able to figure out what it might be but I do know it is the key to their demise. Sesshomaru continues walking ahead but thinks to himself: If these demons are going to be difficult to defeat,I will need assistance with this. He decides to head back to his castle first to get some much needed rest and to obtain his son, Heroshya , who he will have accompany him through this mission. Sesshomaru returns to the castle by the next night. Sesshomaru tells Jaken to inform Heroshya to be ready to head out by day break as he retires to his room where Rin is waiting, She is happy to see him and was worried when he did not return as expected. Sesshomaru holds his wife in his arms as they lie in bed and he thinks to himself: Rin, I will get this blood for you, no matter what it takes...I will not let you die. In the morning Sesshomaru and Heroshya begin to fly out to retrieve the swords that have been made by a demon swordsmith. Sesshomaru tells Heroshya that after they pick up the swords they will need to go directly out on a mission, there the swords can be tested because they will need to kill two demons and retrieve a crystal. Heroshya is a bit confused but does not questions his father's orders. Upon receiving the swords, they are perfectly forged and look to be powerfully fit for the children of a king. Heroshya's sword is the first, Sesshomaru names it 'The Hakai Yoso'. It eluminates with a blue hue and has a brownish handle. The sword has amazing cutting ability and can bring down an enemy with one powerful stoke however it also has an added ability to create two strong elements wind and earth storms, together capable of destructive tornados which will sweep out a village or hundreds of demons instantly. Nephra's sword is a lovely white and is called 'The Mizu Yoso' also having excellent cutting ability but with an added power of the water element which can be manipulated and used the way Nephra wields it. If Nephra transfers her demonic energy to the sword it will turn the water into ice also to be used in anyway she wields it. Zephra's sword is called the 'Kasai Yoso' and is impeccable with cutting just as the other two swords are however Zephra's sword is black and has the added element of fire capable of much damaging inferno, if her demonic power is transferred to it, the fire will turn into black fire capable of instant burning destruction, cutting though or loss of body parts. Heroshya's sword can avert the other two swords by using wind to freeze Nephra's water and Dirt to drown Zephra's fire. Sesshomaru trusts Heroshya to use this function of counter acting the other weapons if either one of the girls were to become reckless with their swords. Heroshya is happy with his sword and carries it proudly in his sash and also holds on to the sword that will be given to Zephra while Sesshomaru carries the sword that will belong to Nephra. Sesshomaru tells Heroshya, "We have one other mission, I want you to accompany me and fight along side me. You are the only one I trust for this." Heroshya tells his father, "I am with you." Sesshomaru informs Heroshya, "We will fly however the trip is long and we will not get there until night fall. " Sesshomaru informs Heroshya that the two demons they are going to fight have never been defeated before, he also mentions the clue that may help destroy them that was provided to him by Shehomachi. Heroshya is not sure what to make of that clue but like his father,he is not worried and decides that together they will find a way to kill the two demons. They reach the castle where Shehomachi informed Sesshomaru would find the two demons that are gaurding the crystal. Sesshomaru and Heroshya walk right up to the gate of the castle and have no problems getting past the gaurds there, quickly slaying them down as they pass right on through. Sesshomaru leads the way using his smell sense to tell where the demon gaurds could be when they finally come across a room leading to an outside. As they step outside they can see the crystal that glows brightly but before they can approach it, the demons appear suddenly flying from the sky and attacking with great force. Heroshya and Sesshomaru both having the ability to fly also fly up as well and the fight continues in the sky under a moon lit night. As he was told, all the attacks that are used on the demons seem to have no effect on them. The swords Buksiaga and the new sword Heroshya has just inherited seem to do absolutely no damage to the demons as Sesshomaru and Heroshya move and maneuver, dodging all of the blows and strikes that come at them. Heroshya lands on his feet and Sesshomaru lands next to him on the ground as Heroshya comments, "We could be doing this all night, We've got to find their weakness." Sesshomaru says, "look out for something that might be guiding their movements. It may be tiny or invisible, keep you eyes open." Sesshomaru flies back up and continues the battle using multiple fighting tactics and weapons. Heroshya flies back up again and pulls out the sword for Zephra in hopes that the fire will cause some damage although nothing has caused damage at this point they don't give up. Heroshya points the weapon at one of the demons and it misses him by inches and instead hits the ground. The demon holds his head in pain, Heroshya notices this and thinks: The demon acted as if he felt that strike but it missed him, I clearly saw the fire hit the ground. Heroshya does not understand why that happened but decides to strike the ground again, He strikes the ground many times with the fire and the first few times does not hurt the demon but the fourth strike of fire catches the demon in the arm. Heroshya is excited that he is now causing pain to the demon but he is not sure how it's happening. He shouts out to his father, "When I strike the ground, they seem to feel it!!" Sesshomaru thinks about Shehomachi's clue: look to something that remains by their side always, it unites with them in their walk, unites with them in their talk, It participates with them in every battle. Sesshomaru looks down at the ground while replaying Shehomachi's words in his thoughts, the moon is shining down and the shadow of the demon is dark but clearly visible. Sesshomaru strikes the shadow with much force using his buksiaga, the demon feels every bit of the force and is frozen with pain as it bursts and dissapears. Heroshya seeing that the shadow is what must be targeted strikes the second demon down using his own sword and the powerful tornado power aimed directly at the shadow to sweep it away. 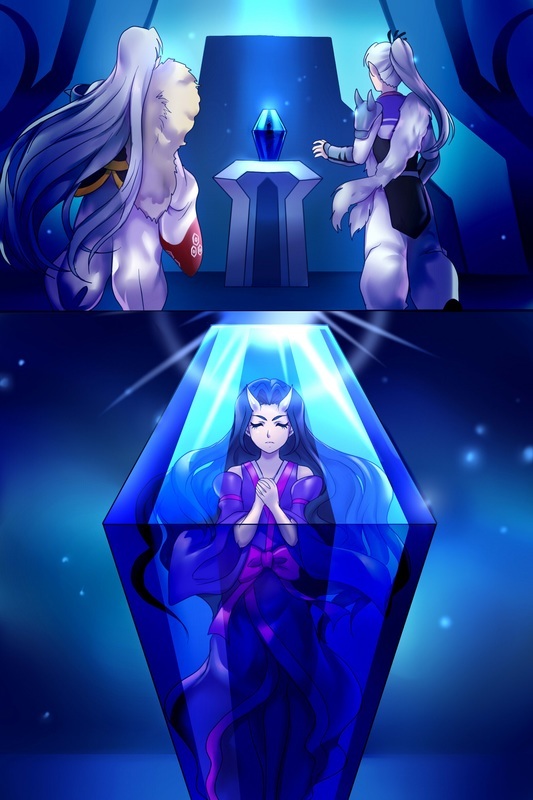 Sesshomaru collects the crystal and head back to Shehomachi to give it to him and obtain the blood he needs. When Shehomachi sees that the crystal has been successfully retrieved, he is extremely happy and wastes no time in giving Sesshomaru what he came for. Shehomachi immediately transfers demonic energy through his body and pricks his finger allowing the heavy blood droplets to fill the vile. He tells Sesshomaru, "Please, take this blood as a gift for returning this crystal to me. This blood will be most useful, I assure you. You can be sure it is working when the one who takes in this blood sleeps for three days without waking while it courses through their veins, this is normal but once awake they will be just fine. No illness, No withered appearance and will sustain life for at least 500 years maybe more however I must warn you, when she does wake, you may notice a difference in her actions and demeanor but she can overcome any changes with the strength of her own will." Sesshomaru takes the vile and leaves out of the crevasse in which he came. When he arrives back to where Heroshya is waiting he is holding the vile of blood, Heroshya can no longer contain his urge to ask, "Father,what was all this for? What are you going to do with that vile of blood?" Sesshomaru responds, "It is of no concern, be content in knowing that you have pleased me by fighting well at my side today." 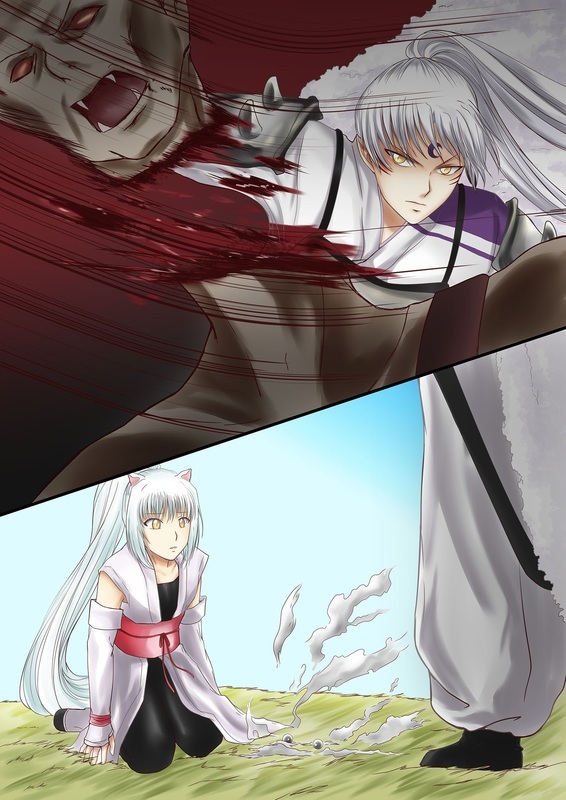 Sesshomaru takes the vile of blood to Rin, while alone in their room he explains everything about Shehomachi and how the blood will help her to live, Sesshomaru gives Rin the option to accept the blood or not, though he expresses that he wants them to raise their children together in good health and long life. Rin feels the same way, she wants to be around for every moment of her children's lives, she does not want them or her husband to experience her growing old, tired and sickly so she agrees to drink the blood and obtain life longevity. She embraces and kisses her husband one last time in case something goes wrong, He assures her she will be fine because he trusts his mother's information. She slowly uncorks the small vile and it takes her only a moment to swallow it down; at the very moment Rin passes out into Sesshomaru's arms. Sesshomaru lies her head back and feels for a pulse to be sure that Shehomachi's words were correct, that she will sleep but not die; to his relief he does feel a pulse. During the three days that Rin sleeps, Sesshomaru stays by Rin's side while every so often feeling for her pulse and breathing. The girls ask Jaken about their mother and father and why they have not come from their bedroom in three days, Jaken explains to the girls that they will just have to be patient and wait until their father shows himself to explain because he does not know. Jaken wonders himself: Do I dare disturb Lord Sesshomaru to inquire? I think I will wait a few more days, then I will ask him if necessary. On the fourth day Rin awakes, she seems to feel better than she ever has before, Sesshomaru does not show his joy but he is elated that Rin is awake and seemingly fine. They finally emerge from the room they spent three days and nights in and when the girls see them, they happily greet their mother and father. Sesshomaru sits the girls down and explains that he has obtained special blood for their mother which should allow her to live as long as everyone else in the family however until he is sure everything will work as desired, they must all keep a close eye on her and look out for her. The girls are so happy to hear that their mother will live long they both shower her with hugs and kisses. Jaken is happy to hear that Rin's life will be saved and very proud of his master for making it happen. Nephra goes to her father, climbs his big chair and gives him a kiss on the cheek and hugs him around his neck, though she says nothing ....Sesshomaru knows she is thanking him. He closes his eyes and embraces his daughter in return. Nephra is in great spirits now knowing that her mother will live beyond her normal years and decides she will pick flowers for her out near the demon village. She happily walks alone with her basket to the area that has the prettiest most fragrant flowers and decides what type of bouquet she would like to create. As she is picking the flowers, Nephra can see a very large shadow slowly making its way behind her, she does not turn around pretending as if she is unaware of the presence behind her but she quickly flashes her finger whip and with great precision the whip wraps the demon tightly around the neck as Nephra uses all her might and both hands to fling the demon up and in front of her with the long demonic whip. Althought the demon has been flung, he quickly and easily gathers himself and stables himself on his two feet. He shoots a demonic venom at Nephra and she quickly jumps and dodges it, he continues to try and attack Nephra with his venom but she easily jumps, flips and manuevers around him. Realizing that she is too fast and nimble for him, he breaths out a vapor toxin to knock her out but Nephra again uses her demonic blast to sheild the vapor. Nephra growing tired of playing with this demon anymore decides she will end this, She uses another blast of demonic energy however this time she uses a stronger blast causing the demon to be knocked back fiercely against a tree and with quick speed she uses multiple demonic whips from her fingers to bind him to the tree. Nephra slowly walks up to him and her eyes begin to turn red, she is transmitting much demonic power with the intent to finish this demon off with a huge blast that will blow him to peices. The demon speaks for the first time, "No Princess Please...have mercy. I am nothing more than a lowly demon that wanted to prove himself to the others in the village. Attacking you was foolish, Please princess...spare my life and I will leave your father's empire that I am most unworthy of serving in." Nephra doesn't mind fighting if she must but she hates the thought of killing, she replies, "How dare you betray my father, I will leave you bound to this tree for my father to deal with you as he sees suitable." Nephra turns her back and begins to walk away leaving the demon bound to the tree. During this time Heroshya is on his way to the castle, he was last told by his father to come back to the castle within 4 days from when they had seen each other last which was the day the vile of blood was retrieved. As he is walking he can hear a scream of a young girl, He is not sure if it's children playing or something serious but his walking slows down a bit when he suddenly smells blood and realizes it's Nephra's blood he is smelling. He thinks: That's Nephra's Blood! Heroshya runs as quickly as he can following the smell of her blood but he feels that he can't seem to get there fast enough and quickly decides to fly as he thinks to himself again: I must get to her, she's hurt already...I hope it's not too late. When Heroshya arrives at Nephra's location, he sees that Nephra is on the ground and the demon is ready to strike her but Heroshya wastes no time pulling his sword from his sash and lopping the head of the demon clean off causing the demon to fall to the ground. The head also falls to the ground but it disintegrates and only the eyes remain transforming into two big, white pearls lying in the grass. Heroshya runs to Nephra and helps her sit up asking her, "Are you okay?" Nephra responds, "I'm okay but I was foolish to turn my back on him. I had him bound to that tree but he somehow freed himself and struck me from behind with his claws. Everything happened so fast, I couldn't react." Heroshya assures her, "You're okay now, You did fine. C'mon let's go to the castle and clean that wound." He helps her to her feet and as they begin to leave Nephra notices the two pretty white pearls on the ground and she picks them up as she asks Heroshya, "I wonder who that demon was, I didn't recognize him but he said he lives here in the demon village." Heroshya responds, "I don't know, I didn't give him a chance to turn around before I chopped his head off so I didn't see his face. Father will not be happy to hear that one of his own demons attacked his daughter." When they arrive at the castle, Nephra and Heroshya stand in front of their father while Nephra explains what happened and gives her father the two pearls that were once the demons eyes that feel to the ground. Sesshomaru looks at the pearls and he knows exactly what tribe the demon belongs to even if he is not sure which demon in particular it was. he explains, " This demon tribe originated from the ocean, they would absorb special pearls from oysters and those pearls would help to strengthen their demonic powers." Sesshomaru thinks for a moment and then sits in his chair as he says, "Very well, that traitors pearls will be used to protect the life that he tried to destroy." He calls for Jaken, "I need two laces to create jewelry for my daughters. Get them to me as quickly as possible." Jaken replies, "Yes, right away Milord." Sesshomaru continues his speech, "These pearl necklaces will serve well as a reminder to my demon empire of what the consequences are when anyone of them tries to attack my family." Sesshomaru goes down to the demon village to cast the Pearl Demon tribe out of his empire but some of them insists their loyalty to him and beg that he not condemn them due to the actions of one unfit demon in their tribe. For those demons that begged to stay, he allows them to remain at his empire but orders them to 30 days of hard labor. Sesshomaru then transfers some of the Tensaiga's healing abilities to the pearls and has given them to his daughters as a gift. Nephra being half demon recovered from her wound quickly however the necklaces created for them is to help them heal faster from serious wounds that would normally take many days to recover from. The necklaces can also help heal someone else if the girls have a desire to heal a friend or loved one but it does not have the ability to restore a lost life as the Tensaiga does. Nephra and Zephra both are given a necklace, Rin standing nearby takes notice of something and she brings this to her husbands attention, "MiLord, did you notice that Nephra's necklace, the pearl remains an eluminating white but Zephra's necklace the minute it touched her body it turned gold almost as if it was slightly mixed with darkness. What could that mean?" Sesshomaru does not answer but he does notice what Rin has showed him and thinks about the Shikon Jewel during the time that Naraku had possession of it; how it turned black when defiled. Sesshomaru worries: Is my daughter tainted with evil inside her, the pearl turned gold not completely black. Still It seems I may need to keep a closer eye on Zephra for her own good.